Jamaica’s Usain Bolt, the iconic double Olympic Champion of 100m, 200m, and 4x100m (races won both in Beijing 2008 and London 2012) will be competing for the third time in a row at Rome’s Golden Gala, the fifth leg of the Samsung Diamond League IAAF circuit, to be held on 6 June this year. Bolt left two impressive marks on Rome’s Olympic Stadium track, by winning the 100m races in 2011 (clocking 9.91) and in 2012 (with a superlative 9.76). Bolt will be running the 100m race again this year, during a night expected to be as rich of stars as in the glorious past of the Golden Gala. 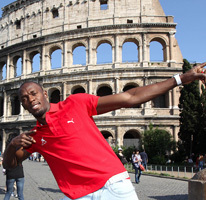 “We are happy that Usain Bolt will be in Rome again – said Alfio Giomi, President both of the Italian Athletics Federation and the Organizing Committee – . We are working hard, together with our partner, CONI Servizi, to be up to the tradition of Rome’s Golden Gala: a meeting rich in champions and in World-class challenges. From my point of view, I wish that the high international value of the Golden Gala may be reached this year with a strong contribution of the best Italian athletes”. More than 50.000 spectators gathered last year in Rome, at the Olympic Stadium, for the 2012 edition of the Golden Gala. Tickets for the 2013 edition of the Golden Gala, the fifth leg of the Samsung Diamond League IAAF circuit, to be held at Rome’s Olympic Stadium on 6 June later this year, are available in all TicketOne shops, and, on the web, at www.ticketone.it. TicketOne is the ticketing partner of the Golden Gala, and will be playing this role for the fourth year in a row. Prices of the tickests will be as follow (all prices in Euro, pre-sell fee not included): Monte Mario Arrivi (Main stand, finish line): 40,00 Euro; Monte Mario Partenze (Main stand, 100m start line): 20,00; Tribuna Tevere, Distinti Arrivi: 15,00; Curve e Distinti: 5,00.